Drying of the phytoliths ready for mounting onto a microscope slide. Clay removal stage using 1L beakers, post being left on the shaker to deflocculate. Removal of organics using Nitric Acid and a hot plate to stimulate the reaction. 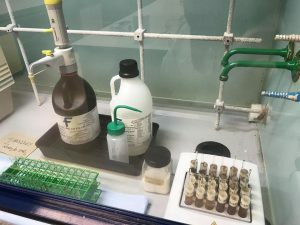 In addition to these steps, I also got to experiment with a sonification stage, which I carried out after the nitric acid organic removal, as I was concerned about the level of clay that was still present in my samples. Putting the samples in the ultrasonic bath made them a lot clearer and removed any remaining clay, as can be seen in the images below. Samples before (left) and after (right) three rounds of sonification, with the supernatant looking much clearer. Once processed you mount an A fraction and C fraction slide for each sample depth and analyse them under the microscope. The identification of phytoliths can take a while to get your eye in on, but I was helped by Jose and one of his post docs, Sarah Elliot, that are much more experienced in the identification than myself! It also helped that Exeter has a relatively extensive reference collection that I was able to look at, photograph, and compare my slides to. 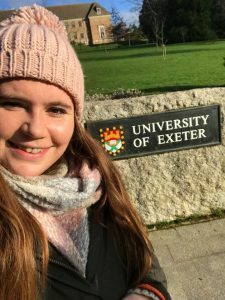 The training I received in Exeter will be extremely useful throughout my PhD and ensure the data I get from my phytolith counts are a true representation of the vegetation present in the environment in the past. The sequence I worked on was highly floristically diverse and I was able to get training on the identification of a full suite of phytolith forms I may see in my PhD samples once they have been collected in the summer. Also during my month away from Reading, I was fortunate enough to be accepted on to a NERC funded advance training course with BOSCORF (British Ocean Sediment Core Research facility) housed in the National Oceanography Centre in Southampton. This core focused on the retrieval, description and analysis of sediment cores. This course was really useful in helping to think about my sampling strategy for collecting my sediment cores from Peru during my planned fieldwork in July. It also introduced us to some of the analytical techniques you can use to get data out of your cores. I have been interested in the prospect of getting geochemical analysis data from my cores for a while as this can help to identify signals of soil erosion / stabilisation with the local environment in your lake core records. For me this is particularly important when thinking about agricultural activity as these periods of soil erosion may be due to either human activity, for example during periods of terrace construction, or due to climate change. Additionally, the presence of phosphates in the geochemical record may provide evidence for animal husbandry and manuring practices in areas surrounding the lakes. This will provide information on whether people in the past were just growing crops or also involved in agro-pastoral activities. It was great to see at BOSCORF this sort of data can come from running the cores through their ITRAX scanner, which will give you a full geochemical characterisation of your core. 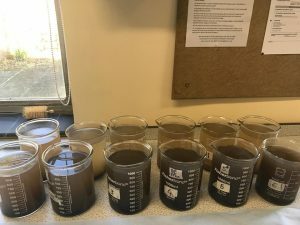 As well as learning about the analytical techniques, we also got to go on a boat trip to see how you collect marine samples and had a tour of their facilities, including a room full of cores – A Quaternary scientist’s dream! This entry was posted in Method, PhD, Phytoliths and tagged Josie Handley. Bookmark the permalink.